Heat oven to 375°F. In 3-quart saucepan, cook ground beef over medium-high heat, stirring frequently, until thoroughly cooked; remove from heat and drain. Stir in tomato sauce, ketchup, water and soup mix. In medium bowl, beat eggs well. Stir in cottage cheese and Parmesan cheese. Spoon 1 1/2 cups of meat sauce in bottom of ungreased 13x9-inch (3-quart) glass baking dish. Top with 4 uncooked lasagna noodles (noodles may not reach ends of dish). Top with half of cottage cheese mixture and half of remaining meat sauce. 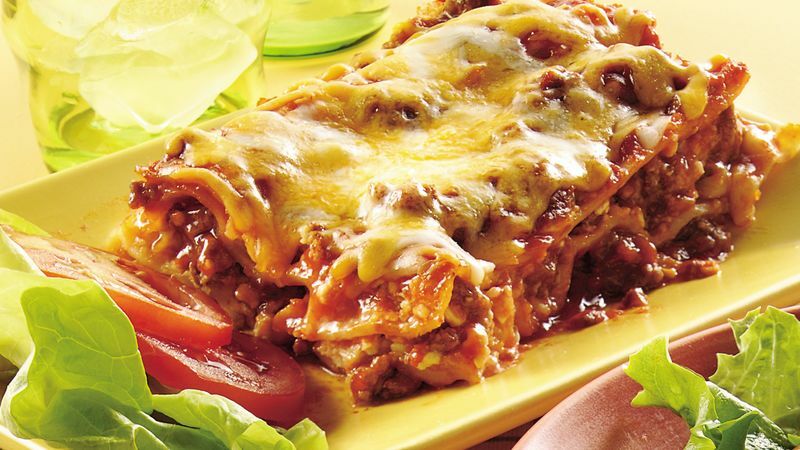 Repeat layers with remaining lasagna noodles, cottage cheese mixture and meat sauce. Sprinkle shredded cheese over top. Cut 16x12-inch sheet of regular or nonstick foil; if using regular foil, spray with cooking spray. Cover dish loosely with foil, sprayed side down. Bake 1 hour or until lasagna is bubbly and noodles can be easily pierced with tip of sharp knife. Uncover dish; bake 10 to 15 minutes longer or until cheese on top is melted. Let stand 15 minutes before serving. The meat sauce may seem thin in the preparation of this lasagna, but the extra water is needed to cook the noodles as the lasagna bakes.